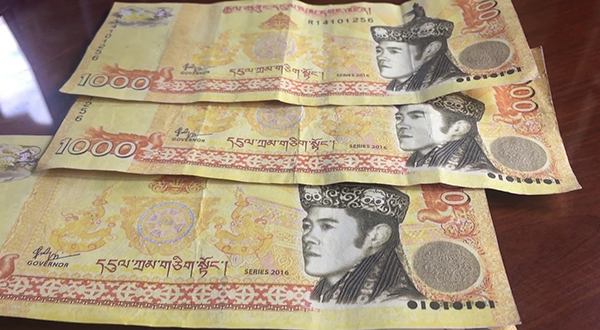 Police in Punakha are investigating fake Nu 1,000 notes after reports of counterfeit money in circulation in the dzongkhag. This week alone, a total of Nu 5,000 fake notes were accepted by five shopkeepers in Khuruthang town. “A man came to my shop to buy two tongue cleaners, which is worth Nu 60. He paid me Nu 1,000 note, I had a strange feeling since the note was faded. But I did not verify it and put it in my cash-box,” Tara Maya Ghalley, one of the shopkeepers, said. Police say shopkeepers should be vigilant with people making small purchases with Nu 1,000 notes. They have alerted the shopkeepers in the town about the fake notes. “We can make out from the paper quality. It is thin and feels like its made out of computer papers. The colour is also not dark and it lacks certain features,” Lieutenant Jigme Thukten of Punakha Police said. The police are also encouraging all the shopkeepers to install CCTV cameras in their shops for better monitoring. A similar case of counterfeit note was reported in July this year.